What does it take for your average person on the street to step in when they whiteness a crime, or say a gang of youths intimidating people? That may sound like the words of your average man on the street, overwhelmed and intimidated by what he was witnessing, seeking another to intervene. They’re actually the words of Andreas Schoyen, a former Corporal in the Royal Danish TA Ranger Corps and with the Royal Danish Navy Military Police. Even trained ex-Military personnel find it hard to step-in in those kinds of situations. A short while later in Islington, Schoyen was handed a recruitment flyer by a guy wearing the famous red beret and jacket of The Guardian Angels, presenting him with the chance to ensure that the next time a member of the public needed his help on London’s streets, he’d have the numbers behind him to intervene. The Guardian Angels were formed by a former McDonald’s night manager Curtis Sliwa in New York City, 1979. NYC was a seriously dangerous place back then, its murderous streets riddled with urban decay, before it was cleaned up and whipped in to the world’s most famous tourist spot in the 90s by a change in approach by the NYPD and former City Mayor Rudy Giuliani. Sliwa was appalled by the levels of crime and violence he saw each day, particularly on the city’s subway system. 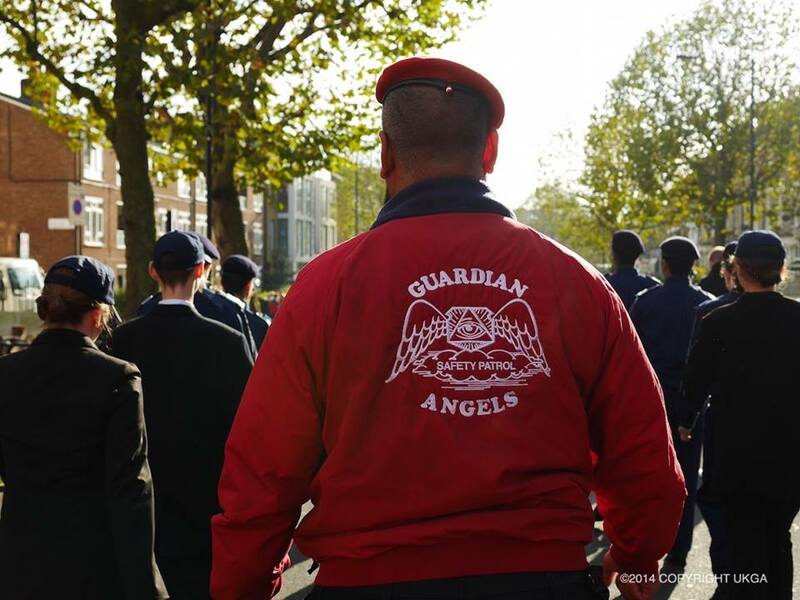 He banded together a group of similarly concerned NYC residents and staged ‘Safety Patrols’ in trouble areas, christening his new organisation The Guardian Angels, kitting them out in high visibility red berets and jackets; a uniform that would make the Angels famous across the world. Chapters sprung up as far away as Japan, Indonesia, Israel and Europe. Having been handed another flyer in Islington, Andreas would reconnect with The Guardian Angels in his newest adopted city, completing the months of mandatory training required of a recruit before being allowed on foot patrol. “We trained general self-defence techniques and Gracie Jiu-Jitsu” explains Schoyen, who rose through the ranks to become UK National Director, as well as Assistant European Coordinator for the organisation under his Angels nickname Hawk. As New York became safer during the 90’s, the Angels’ patrolling of the streets and transit systems became less frequent, and with it came a drop in profile that would see the number of new recruits dwindle year on year, both in the city ubiquitous to the organisation, and subsequently across its many national and international chapters. Funding, traditionally arriving in the form of corporate sponsorship and donations in the US, also became an issue as the group’s profile shrank. “We in the UK are working on getting the same type of funding, as well as other methods” explains Schoyen, who along with his team shell out for their own bus and rail fares whilst on duty patrolling public transport in the capital; something the City of New York traditionally covered for the NYC chapter. “Yes, that’s true. We are in negotiations with Transport for London (TFL) to see if they are willing to give us the same help,” says Schoyen, ever the diplomat. Ultimately The Angels are community spirited volunteers who pay their own way to help keep their community safe. Other cities around the world allow their Angels to ride for free in light of their selfless commitment to community wellbeing; not so London. I ask Andreas if this financial burden is a factor in the number of recruits signing up to the London Chapter dropping dramatically in recent years? “I think it is a mixture of factors. It was a new and exciting thing when we first started a GA Chapter here in the UK. Hence the large numbers of volunteers. Society has become more egoistic, with young people’s mind set of ‘what can my community give me’, instead of ‘what can I give my community’. And it’s the reaction from his community that keeps Andreas and his team on patrol.